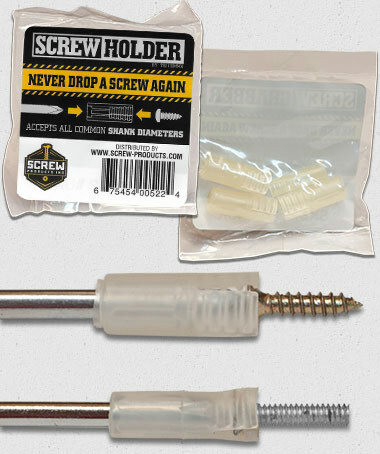 Screw Holder - Never Drop a Screw Again!Star Drive Wood Screws – Screw Products, Inc. The Screw Holder is a transparent rubber sleeve that slides onto screwdrivers to hold a variety of screw sizes to the end of a screwdriver. 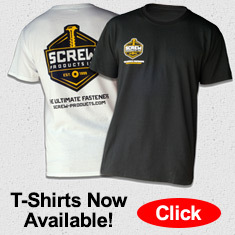 You will never drop a screw again! #SH4PACK Screw Holder - Never Drop a Screw Again! NEW #SH20PACK Screw Holder 20 Piece now available! Flexible: Bends and conforms to all common shank diameters. Reusable: Durable rubber withstands continuous use. Comes in Two Sizes: Small fits shanks #0 Large fits #1, #2 + metric sizes. Has a Ribbed Interior: Horizontal ribs keep the screws straight. Fits Multiple Drivers: Fits Slot, Hex, Torx, Square & Phillips. The DIY 4 pack is the entry level set to help with all your projects. The ribbed head interior keeps screws straight while the interior taper adjusts for a wide variety of screw head sizes. The ribbed shaft interior was designed to have constant contact with the drivers shank, the 4 points of contact allow for a wider range of shank diameters. It also reduces friction while sliding the holder up or down the shank. Usage is simple. Take your screwdriver and slide the sleeve onto the end of the shank. The head interior is tapered, so simply adjust the depth to fit the screw head size. Next, insert the screw head into the holder, and there you have it a firm hold for any angle. We have produced the Screw Holder in two sizes. This range covers nearly all standard size screws found in the household or construction site.